The Harp’s origins may lie in the sound of a plucked hunter’s bow string. The oldest documented references to the harp are from 4000 BC in Egypt and 3000 BC in Mesopotamia. Harps appear in ancient epics, translations of the bible and in Egyptian wall paintings. This kind of Harp, now known as the Folk Harp, continued to evolve in many different cultures all over the world. The Celtic Harp is small to medium-sized and usually designed for traditional music. It is prominent in Irish, Scottish and other Celtic cultures within traditional music and as a social and political symbol. The Bodhrán is a frame drum similar to instruments distributed widely across northern Africa from the Middle East, and has cognates in Arab music and musical traditions of the Mediterranean region. Some claim that its name is derived from the Irish word bodhar, meaning deaf, and that this indicates that it has been known on the island long enough to have acquired the name. 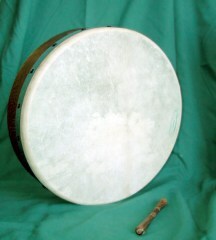 However, there are no known references to this particular name for a drum prior to the 17th century, and the frame drum itself was observed in Irish traditional music only in the 1960s: popularised by bands such as The Chieftains. The Bouzouki is the mainstay of modern Greek music, and is also found in Irish music. It is a stringed instrument with a pear-shaped body and a very long neck, similar to a Mandola. The Greek bouzouki was introduced into Irish traditional music in the 1960s. Soon after, the Irish bouzouki began to develop into something like its current form. Today, the Irish bouzouki is an important part of the Irish traditional scene, most often playing accompaniment: a mix of two note chords and basslines rather than the melody.